According to various studies, the United States is beating its energy reduction and renewable energy production goals beyond any federal predications. 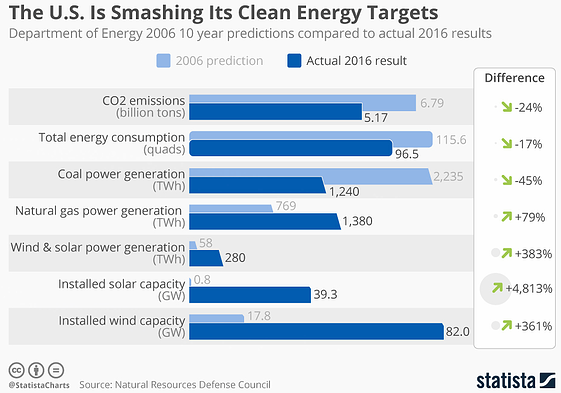 Total energy consumption in 2016 was 17% lower than expected, wind power production was 79% higher, and solar production was 383% higher than the United States Department of Energy predicted in a February 2007 report, as stated in the October 5, 2017 Statista Portal. In addition, a 2017 U.S. Energy and Employment Report finds that 45% of the 1.9 million workers in the Electric Power Generation and Fuels technologies are in the low-carbon emission generation technologies (renewables, nuclear, and advanced/low emission natural gas). A majority of citizens in developed countries have been personally touched by renewable energy production and consumption in one way or another. But has the average person reached the point of acceptance and is this the direction in which we will continue? As a country, we have made great strides toward cleaner energy production, but will this trend endure without federal government support? I feel the renewable industry is at a tipping point that could go either way depending on individual, commercial, and state-level support. The federal government is poised to repeal and defund most of the environmental, energy efficiency, and renewable support, regulations, and mandates. I experienced this same situation in my work in 2000. During the final two years of the Clinton administration, I ran a federal Climate Wise program in Burlington, Vermont where we provided an energy audit to commercial and industrial companies and helped them write a five-year carbon emission reduction plan. The program was quite successful until the election of George W. Bush in 2000. Even before he actively took office, participation in the program dropped significantly. People told me, “let’s wait and see if it will still be required.” Although companies didn’t pay for the audit and energy reduction would save them money, it wasn’t valued by them and they couldn’t be bothered. However, fast forward to 2017 and we are seeing a very different response to the federal government’s rollback of energy efficiency programs. States, cities, and business owners across the country are maintaining their commitment to energy efficiency because they realize it makes economic sense and improves their resiliency to climate change-related events. It is just too costly to leave properties vulnerable to the increased severity of storms or to keep paying for wasted energy. On the other hand, Vermont has seen a significant movement against more development of renewable power. People are voicing concern about wind farms and, to a smaller degree, new solar farms, on the basis that they harm surrounding ecosystems (concerns that may or may not be founded) and change the natural landscape. I know this discussion is familiar to other areas across the country and globe. The U.S. government is also reversing its support for renewables, energy efficiency, and promotions of new technologies. It is poised, for example, to rescind the $7,500 federal tax credit for electric vehicles at the same time that car manufacturers are investing heavily into their development and production. USA Today reporter Nathan Bomey wrote, “While most analysts expect electric cars to reach cost parity with traditional vehicles in the coming years, the tax credit’s swift demise could undermine momentum for the technology.” In the late 1970s, oil companies helped kill the electric car, as discussed in the film, Who Killed the Electric Car? Could this happen again? On the utility scale, a large problem with renewables is that our distribution system is not set up for the fluctuations of solar and wind production caused by the availability of sun and wind. Germany, for example, has eliminated the government-set subsidy (feed-in tariff) which spurred the enormous growth of solar and wind farms in the past years. Without industry-scale storage or grid upgrades to transport excess power across the borders within Europe, Germany is finding it cannot use all its renewable generation during times of peak production. In addition, they are still operating fossil-fuel generation plants to secure generation during low-renewable production times. In response to these challenges, the past few years have seen an incredible increase in the development of new technologies that will propel the usability of renewables. Large companies such as Siemens and Tesla are investing heavily in battery storage systems, and automakers all over the world are producing all-electric vehicles. In 2016, the U.S. saw a doubling of mega-watt battery capacity as compared to 2015, mainly due to “increased comfort that the large (battery) storage facilities can be used to help manage peak demand…. and…. ‘massive declines’ in the price”, according to an article by Herman Trabish in April 2017. This is also true for industrial and commercial solar installations. On an individual scale, auto manufacturers all over the world are developing cars with longer range batteries and vehicle prices are dropping, making the electric car more agreeable to the average consumer. Some manufacturers in Europe are even moving toward phasing out combustion-engine vehicles completely. It’s a delicate time for the future of renewables. The development, production, and implementation of renewables already represent a significant portion of our economy. Retracting from these industries will have a profound effect on our economic stability and the future resiliency of this country. While this is true, the technologies are so new and subsidies are disappearing at a time when problems have yet to be solved. People may be dissuaded from supporting the shift to renewables, so prices may not continue to drop, and companies may not continue to invest if the demand erodes. I wonder what will be faster – the erosion of support that stops momentum or the individual’s support that will sustain momentum even when the federal government doesn’t lead.